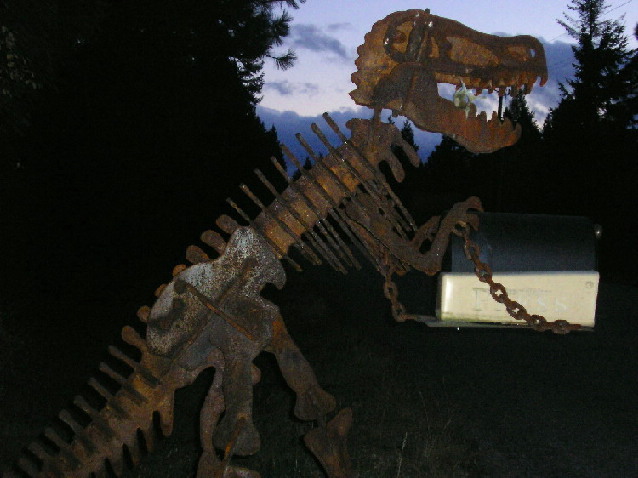 A Tyrannosaurus Rex mailbox made of recycled metal. Neat mailbox. The newspaper box is so bright that it really stands out, and my eyes keep getting drawn to that area and away from the rest of your photo. I find the letters (or whatever) and the small area of sky distracting. Trash recycled into functional art is no longer trash. very underexposed. a nice subject, but not well done. I don't really get a sense of garbage here and I feel that the flash lighting is a little harsh. Proudly hosted by Sargasso Networks. Current Server Time: 04/24/2019 03:52:07 AM EDT.